While every Apple junkie from Albuquerque to Zurich is fixated on Friday&apos;s Apple Watch hullabaloo, Google fans are having the last laugh — all thanks to a urinating Android. That&apos;s right. That is indeed an Android bot relieving himself all over an Apple logo. The quirky feature can be found by visiting these coordinates on Google Maps, a spot near Rawalpindi, a city in Pakistan. First spotted by Team Android, the easter egg doesn&apos;t appear to be an inside job. A Google spokesman told Mashable that the tongue-in-cheek illustration was "likely" the result of someone misusing the Map Maker tool, which lets the Google community change up the company&apos;s map service. "Even though edits are moderated, occasionally the odd inaccurate or cheeky edit may slip through our system," the spokesman said in a statement. A Team Android reader pointed out another "cheeky" Easter egg: the message "Google Review Policy Is Crap." Here are the coordinates. It&apos;s certainly not the first tiff involving Google and Apple, famous rivals in the tech scene. But it is one of the saucier examples. 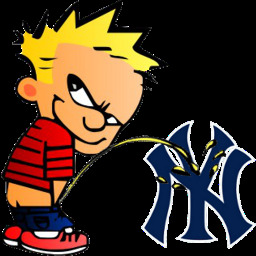 It appears to be modeled after that peeing Calvin decal, which has been used to express distaste for everything from the New York Yankees to the Islamic State. Who&apos;s behind the prank? Daily Dot reporter Mike Wehner ventured into Google Map Maker to try to spot the culprit. He discovered that Google has been deleting new edits from the region in Pakistan, and one anonymous user has been responding by writing "LOL." But the real vandal, according to Gawker, is a Map Maker user called nitricboy, who finished the urination prank on Thursday. Nitricboy has also been creating corporate logos out of parks and ponds around Pakistan. Google&apos;s response: A spokesperson told Mashable that the team is working diligently to scrub the page of its hilariously naughty addition. "We&apos;ve been made aware of the issue and are working on getting it removed," he said. Google sent Mic a similar response. "The vast majority of users who edit our maps provide great contributions, such as mapping places that have never been mapped before, or adding new business openings or address changes," a spokesperson added. "We also learn from these issues, and we&apos;re constantly improving how we detect, prevent and handle bad listings." Updated: April 24, 2015, 12:10 p.m.